Professional navigation on notebook, Car-PC or PDA with door-to-door routing and Touchscreen optimized interface. Audio navigation prompts are combined with a clear map display on the PC. - due to the intelligent self-learning mode (ETA), time is calcula-ted on the basis of individual driving behaviour, resulting in a more accu-rate calculation of the time of arrival. - only a few tags are sufficient to influence the routes. • Dynamic navigation: The latest TMC information is received on a TMC receiver free of charge and used to update the route while on the road. Sehr guter und motivierter Support! Sehr gute Anbindungsmöglichkeiten an bestehender Software! Altes Kartenmaterial (Q2/2010) bei Lieferung (Q2/2011). Super Programm für die Navigation. Toppt den Destinator welcher im Centrafuse enthalten ist allemal. 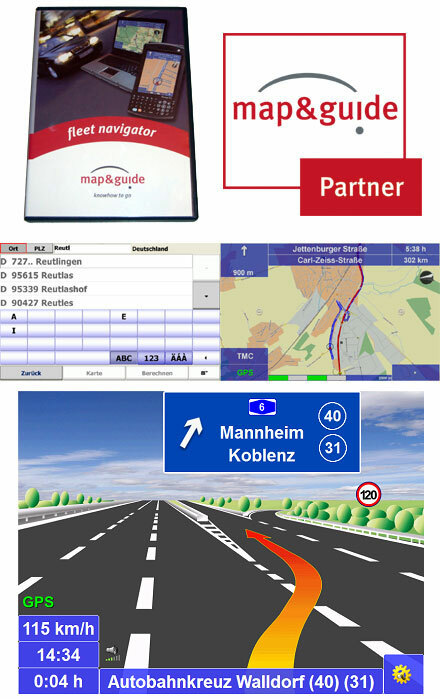 Gutes Navigationsprogramm mit einfacher Handhabung und Installation auf PDA. Die Darstellung auch im 3 D auf dem PDA ist ok und die Zusatzfunktionen sind mehr als ausreichend. Rundum ein gutes Programm. Die schnelle Lieferung und der Service von Cartft.com sind absolut TOP!